Wed, Feb 13, 2019, 09:21 pm SL Time, ColomboPage News Desk, Sri Lanka. 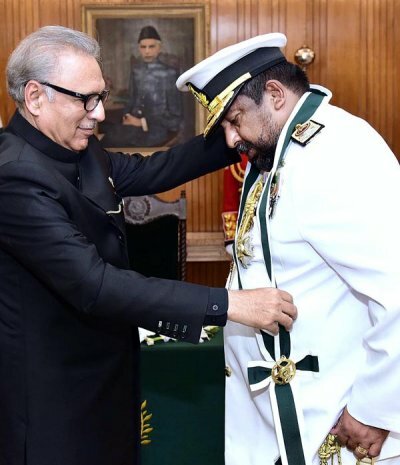 Feb 13, Islamabad: Pakistan's President Dr Arif Alvi Wednesday conferred Nishan-i-Imtiaz (Military) upon Chief of Defense Staff of Sri Lankan Armed Forces Admiral Ravindra Chandrasiri Wijegunaratne in a special investiture ceremony held here at the Aiwan-e-Sadr, Associate Press of Pakistan reported. Chairman Joint Chiefs of Staff Committee General Zubair Mahmood Hayat NI (M) and senior officers were also present in the ceremony, a press release issued by the President's Media Office here said. Speaking on the occasion, President Alvi emphasized that Pakistan attached great importance to its relations with Sri Lanka which had stood the test of time. The President underscored that Pakistan considered Sri Lanka an important regional country, contributing significantly towards regional and global peace and cooperation in the field of defense was an important aspect of Pakistan-Sri Lanka multi-faceted relationship. He appreciated Sri Lankan Navy's participation in AMAN-2019 with assets and observers. Admiral Wijegunaratne thanked the President and the Government of Pakistan on being awarded with NI (M) and hoped that bilateral relations between the two brotherly countries would further grow in future.